Thanksgiving is fast approaching. Throughout most of our homes, family and friends will come together around the table to give thanks and share a delicious meal. Turkey, stuffing, mashed potatoes and all of the trimmings will fill most tables. Well, at least we wish it was most tables. However, many of our own neighbors will not be enjoying an abundant meal because they don’t have the money to shop for food for their families. Our food pantry, the Main Street Market Food Pantry, located in the downtown Riverhead area at 901 East Main Street, Suite 500, will help provide sustenance for those in our community that depend on us. Our very own neighbors come in each week on Wednesday, between 9:30 a.m. and 2 p.m. and pick up food items that we are allotted from Island Harvest and Long Island Cares. This year leading up to Thanksgiving and throughout the holiday season, we will host a special food drive. We are making an extra effort to reach a new audience for support and we’re seeking donations of food items for the holiday table. 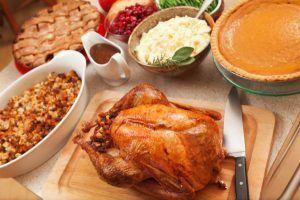 This may include non-perishables like instant mashed potatoes; canned corn, green beans or cranberry sauce; or fresh ingredients like potatoes or even a turkey. We do have the proper storage to hold fresh or frozen turkeys and would distribute these on a first-come, first-serve basis each week. In addition, our Main Street Market Food Pantry is seeking personal care items such as: toothpaste, soap, shaving cream, deodorant and other toiletries. These items are very important as well because our partnership with Island Harvest and Long Island Cares does not provide products other than food. The community who depends on us continues to grow, especially after the closing of another large food pantry provider in our area. We need your help! How can you donate to our food drive for Thanksgiving and the holiday season? Stop in at 901 East Main Street, Suite 500 in Riverhead any Wednesday from 9:30 until 2 and drop your items with Ricky or one of the members of our food pantry team. If Wednesday is not convenient for you to visit, items can also be delivered to our main office reception, around the building at Suite 508.